Anne Salomon is one of VOKRA’s many dedicated volunteers. 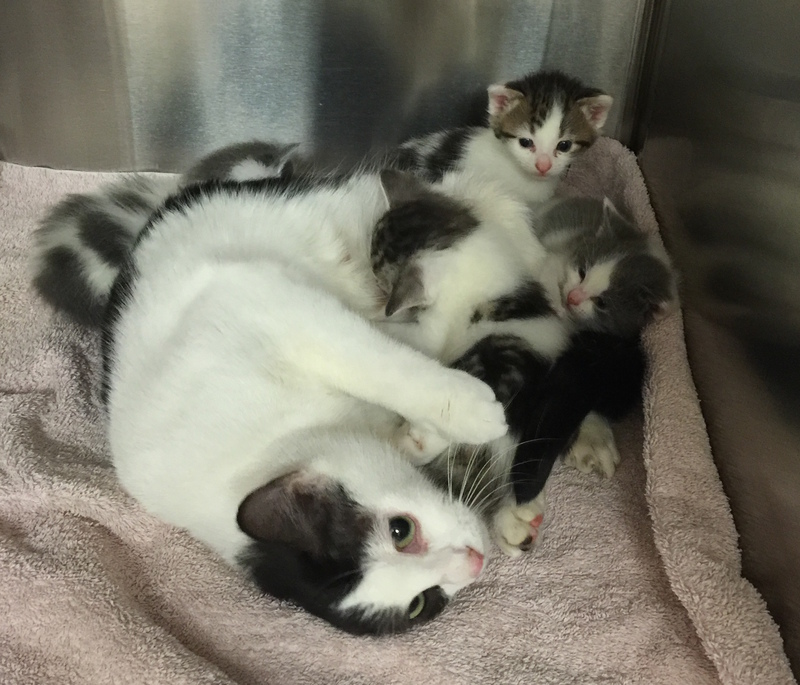 Here she tells us what went into the recent rescue of two injured cats and four adorable kittens. VOKRA received a frantic call and several e-mails the evening of December 1 from a lady who had found a cat with what she described as a broken leg. She also said the cat had milk. I was contacted by VOKRA co-founder Karen Duncan and asked if I could call the finder. I did and the finder told me she and her daughter live in a small townhouse complex in the Newton area of Surrey and they had come across a cat with a broken leg the night before. They’d picked up the cat and put it in an abandoned car in the parking lot with food and water while they tried to figure out what to do. 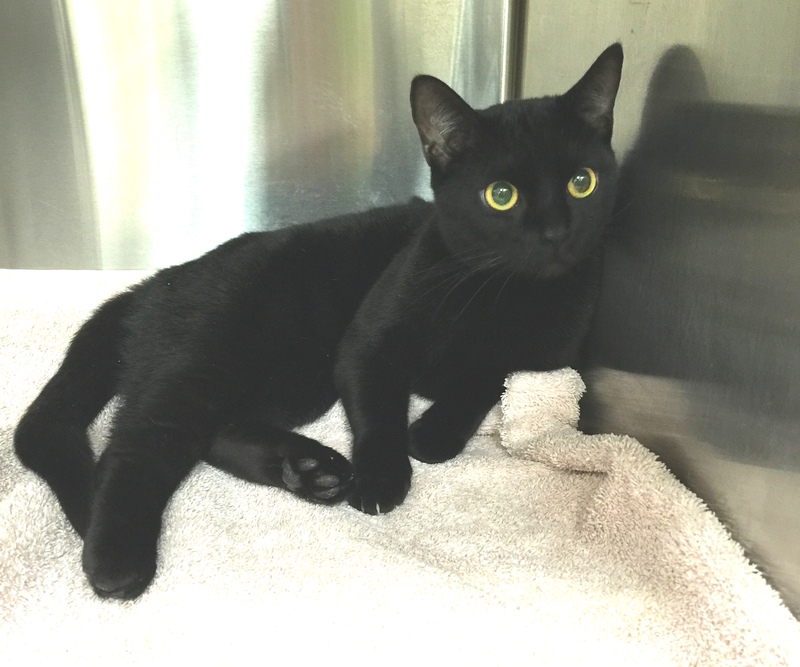 The next day they took the cat to an animal hospital in Surrey for examination. Her left rear leg sticks straight out when she stands up and the vet advised the injury could possibly be an old one. They were also told the cat was either pregnant or recently had kittens. She needed an X-ray, but the finder could only afford to pay for the exam and de-fleaing so they took her back to the car and gave her food and water again. The cat was purring up a storm, eating well and didn’t seem to be in distress. They then started posting on Facebook about the cat needing help and someone suggested they contact VOKRA. I discussed the situation with Karen and a fellow trapper and, although it was urgent to look for possible kittens, we decided it was too late in the evening to head out. 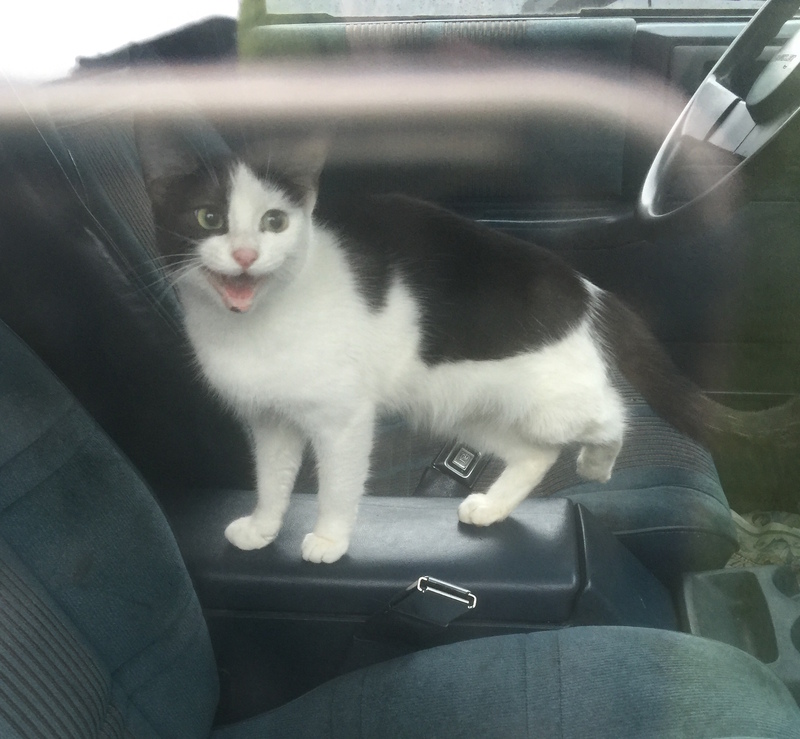 The next morning I attended the site and met the finders and the cat in the car – what a sweet kitty! In my opinion she was not pregnant but engorged with milk, so I transferred her to a carrier and secured her in my car. We then started the search for the kittens in the area where they had found the cat. There were not many places outside to hide so I started knocking on doors and asking if anyone had seen the cat or kittens. A few people said they’d seen the cat limping around the parking lot at the side of one of the buildings but no one had seen any kittens. The corner unit had a lot of debris outside so we searched that – but no kittens. I knocked on the door and after getting no answer we proceeded around the building and saw the unit had a small fenced in yard. There was an old cat bed there so I lifted the clasp on the tall gate and went in the back yard. I noticed the sliding door was open a bit so I yelled ‘hello’ and a young man showed up. I asked him if they had a cat. He said yes, but it had died the day before. I asked if he had seen any kittens and he said yes, but I’d better go back to the front door and talk to the owner. I asked the finder and her daughter to go home and wait for me there while I sorted things out. A young woman opened the door and I told her we were looking for some kittens of a black and white cat. She looked confused and said she had a black and white cat but someone had come to the door the day before with a bag containing a dead black and white cat and asked if it was her cat. She had been missing her cat since the evening of November 30 but was too upset to look at the cat in the bag. I offered her my sympathy and told her the cat we had found had a broken leg and recently had kittens. She looked really confused and said her cat had a broken leg and she had four kittens upstairs. It turns out the dead cat was not hers. She went and fetched a basket with four cute and cuddly little four week old kittens. She told me someone had dumped two adult cats at her door a couple of months ago that were purportedly from a drug house. 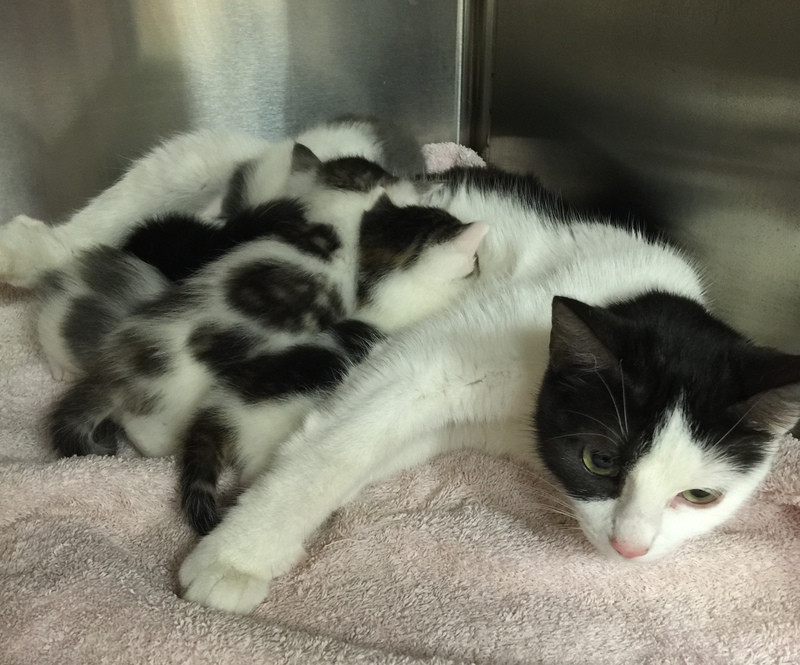 She took them in and fed them and the black and white cat had the kittens. She said they told her the cat had been born with the leg that way. The other cat was a black cat and she went and got it from the living room. 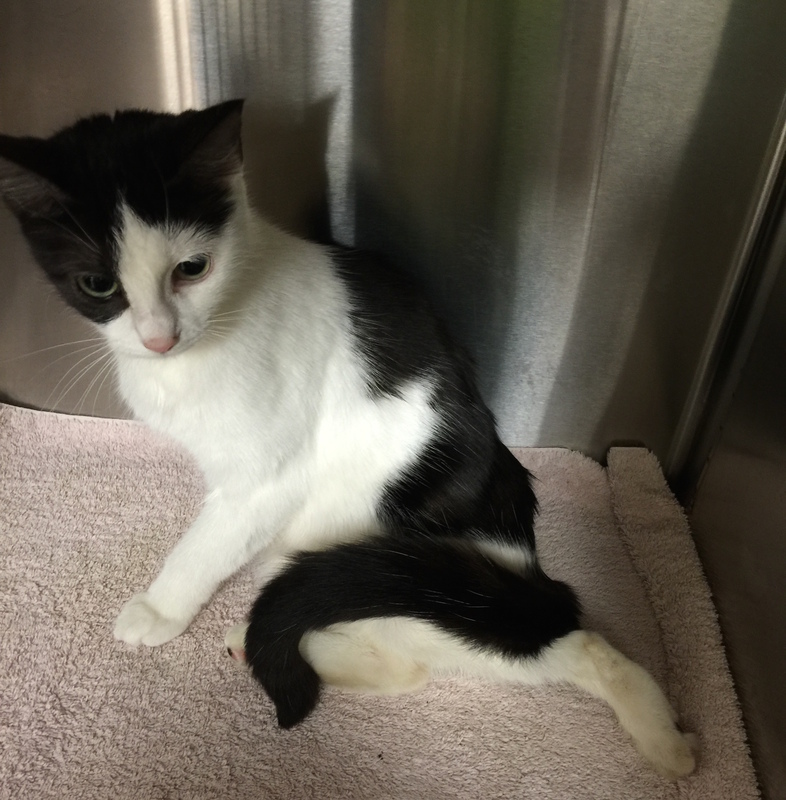 This cat was also limping on one of her rear legs and the other leg was swollen. The rear end of the cat seemed completely out of alignment. The woman said it must have been hit by a car as it wasn’t limping last week, but she couldn’t afford to take it to the vet. We had a nice long conversation about the cats and what was in their best interest. I told her she had done a good thing feeding the cats after they were dumped at her door step and explained what VOKRA would do for the cats. She finally agreed to give them up to our care so I packed them all up and re-united the kittens with their mom; it was a noisy sucking reunion! 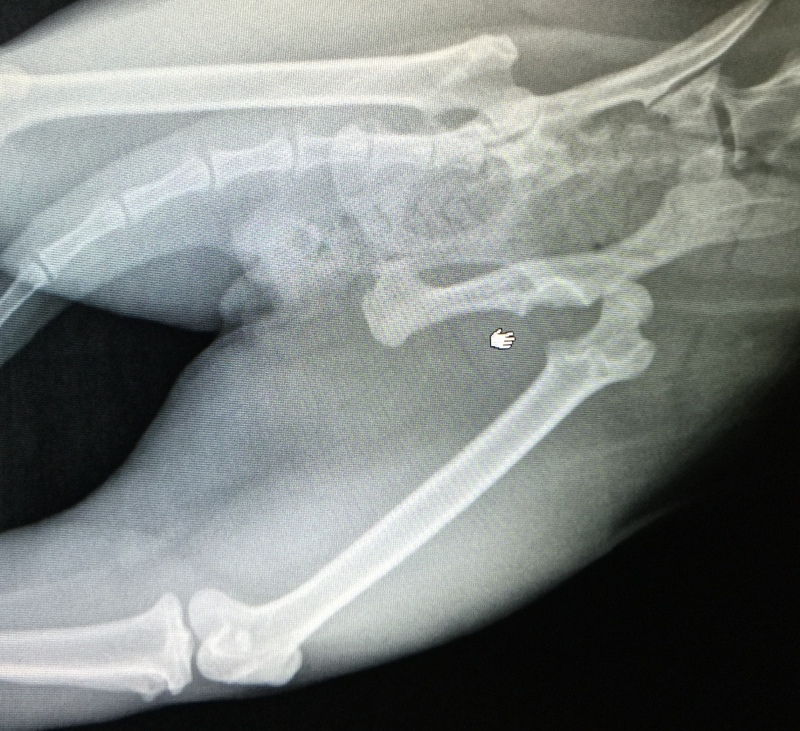 I thanked the original finders for all they’d done for the cat and then I went straight to the vet with the brood for X-rays and examinations. The vet determined the momma cat’s injury was indeed old, she as possible born that way or injured as a kitten, and he recommended nothing be done. 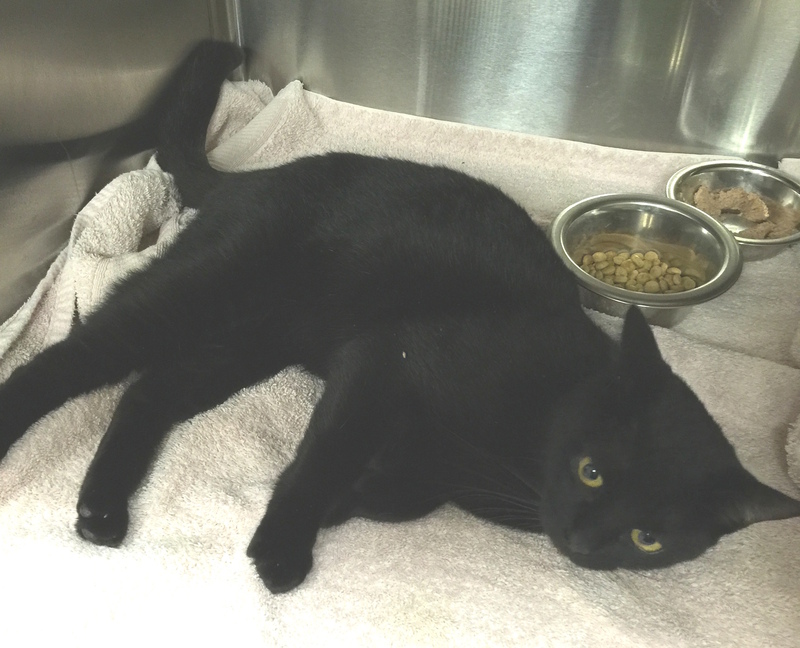 The black cat however had a nasty hip injury where the femur was pulled right out of the hip socket on the one leg and a partially healed soft tissue injury on the other leg. After authorization from VOKRA it was decided to proceed with the expensive surgery to help this poor sweet soul. I took the mom cat and kittens to VOKRA where they’ll be put in foster care and the black cat will have the surgery in the next day or two. If it wasn’t for VOKRA, the kittens would never have been re-united with the momma and they’d have grown up, un-spayed/neutered and gone on to produced many offsprings. The black cat may eventually have died from her injuries and both cats may have fallen easy prey to a coyote or run over by a car. So all in all, it was a good rescue day! As a volunteer-driven non-profit, VOKRA relies on the support of donors like you to help rescue more than 1,800 cats and kittens each year. 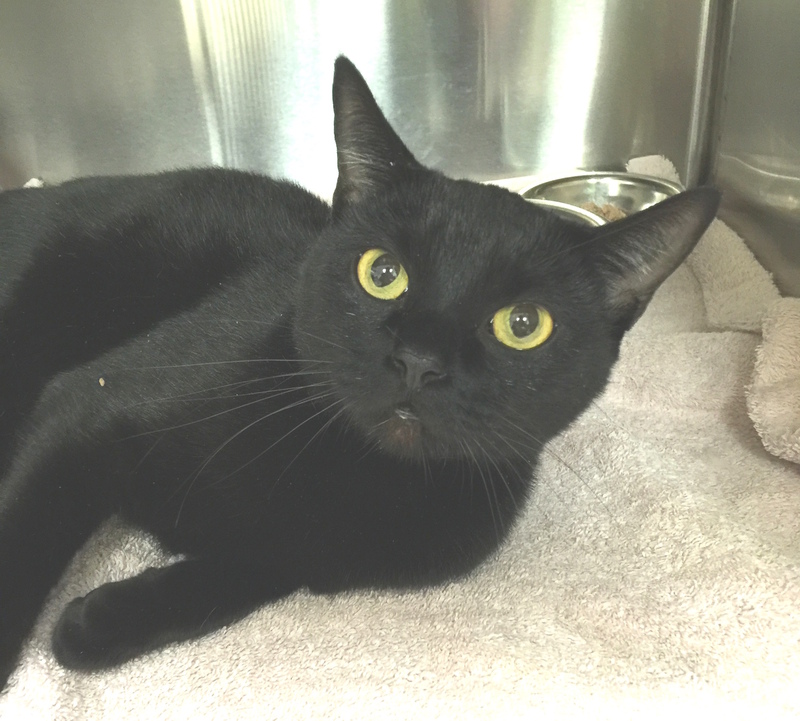 The cost of surgery alone for this black kitty will be in excess of $1,000. If you’d like to help us pay for her care, and the care of all the other VOKRA cats and kittens, please donate today at givetovokra.ca. « Will You Be Our Santa Claws? Just donated in honor of the black kitty, in gratitude. We adopted a black cat in 2008 from VOKRA (Dash, now Zaphod; adopted along with Lacey). He needed surgery as soon as he was picked up, so before we ever met him. Thank you for the work you do. Thank you so much for your gift! We really appreciate the support!